Although you may not expect to see exciting birds in the city, if you keep your eyes open you will be surprised at the diversity of species you can see in urban areas! We had just parked at the Galveston Visitor Center on Friday, February 1st – a foggy, chilly morning – when my husband Bobby noticed a raptor perched at the base of the steeple of the First Baptist Church across the street. Our first thought was that it might be a Peregrine Falcon, but once we looked at it through binoculars we could see that it was a juvenile Red-tailed Hawk. That intersection at Sealy Avenue and 23rd Street is quite birdy, with four species of doves (Mourning Dove, White-winged Dove, Eurasian Collared-Dove, and Rock Pigeon) easily seen in the Visitor Center parking lot. 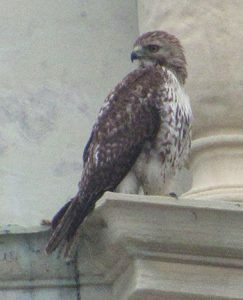 The immature Red-tailed Hawk probably discovered that prey is consistently available there, and it perched high up on the building to survey the scene, just as it normally would from a tree. Our photos aren’t that great due to the fog, but they do show enough of the field marks to identify the bird: dark brown plumage with lighter chevron patterning above, light underneath with a streaked belly band, thin barring on both the wings and the slightly reddish tail, and wings and tail that are approximately the same length. 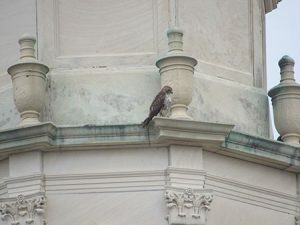 If you’d like to go see if you can find the hawk, the photos also show where to look on the building, near the architectural elements at the base of the steeple. It’s worth the trip – we’ve seen up to 15 species of birds from this parking lot without any effort. While you’re in the area, be sure to drop in at the Galveston Island Nature Tourism Council office just across the street in the old Sears building, and at the Visitor Center, if they’re open. They have a lot of great information about birding and other activities in the Galveston area, and they’re always happy to answer questions. Contributed by Kristine Rivers, founder of Birding for Fun.